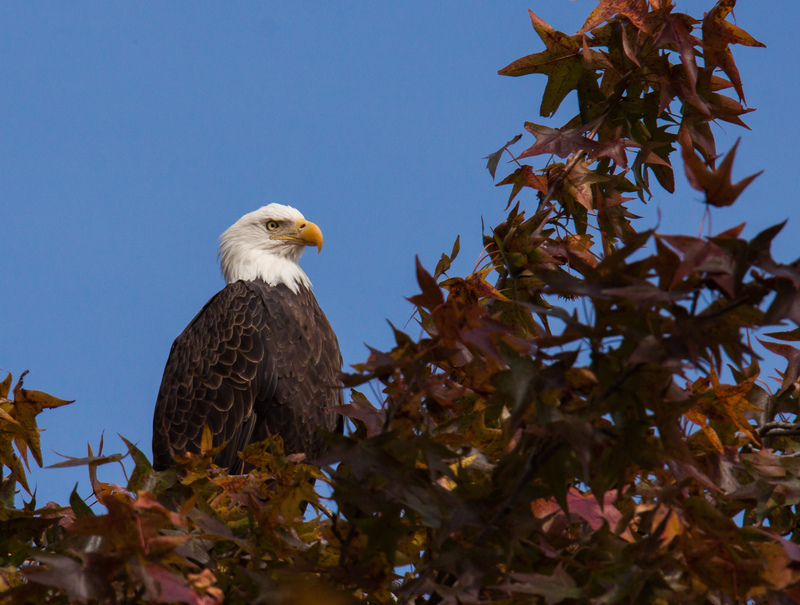 In theory, it is easier to spot a Bald Eagle (Haliaeetus leucocephalus) now that the leaves have fallen from the trees. 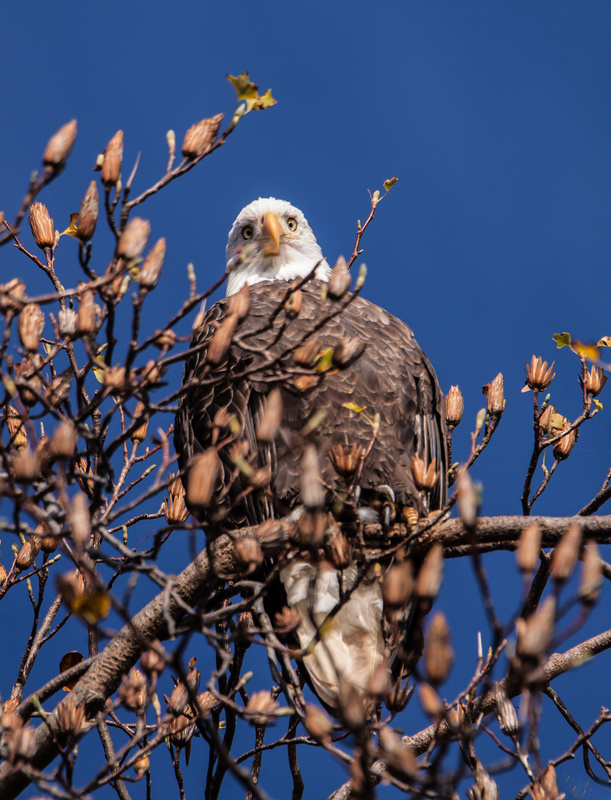 In reality, however, the eagles often seem to like to perch in locations where they are at least partially hidden by branches. 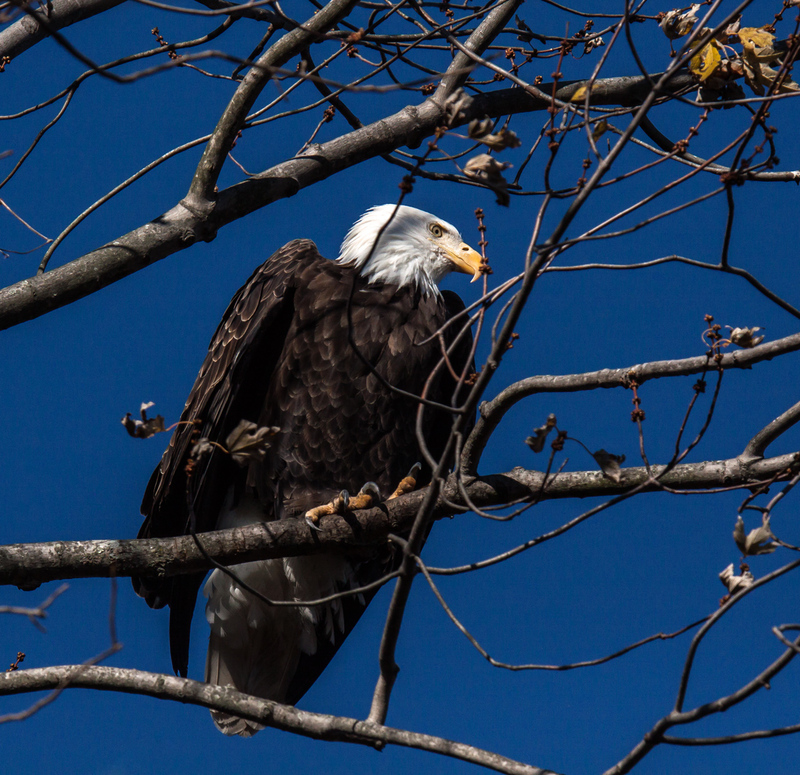 That was certainly the case this past Monday when I spotted this bald eagle at Occoquan Bay National Wildlife Refuge. 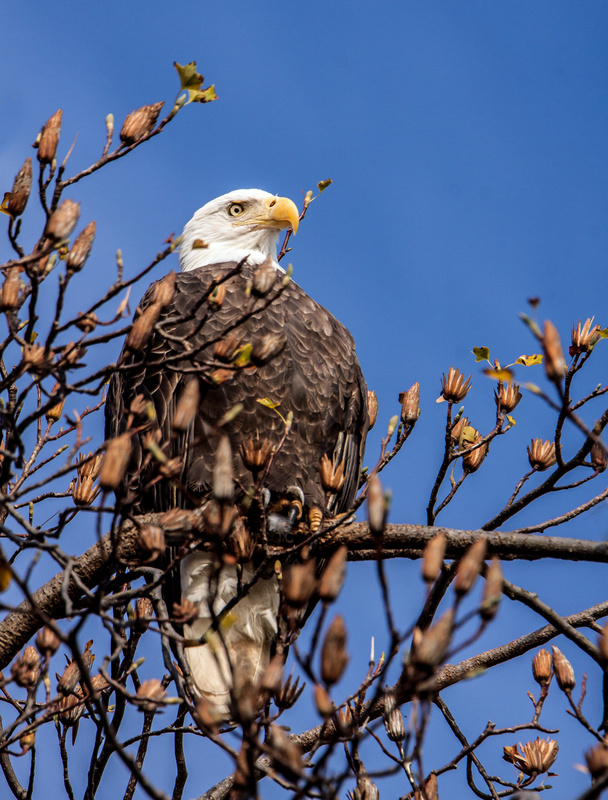 There was a lot of tangled vegetation between me and the eagle, so there was no way that I could get any closer. 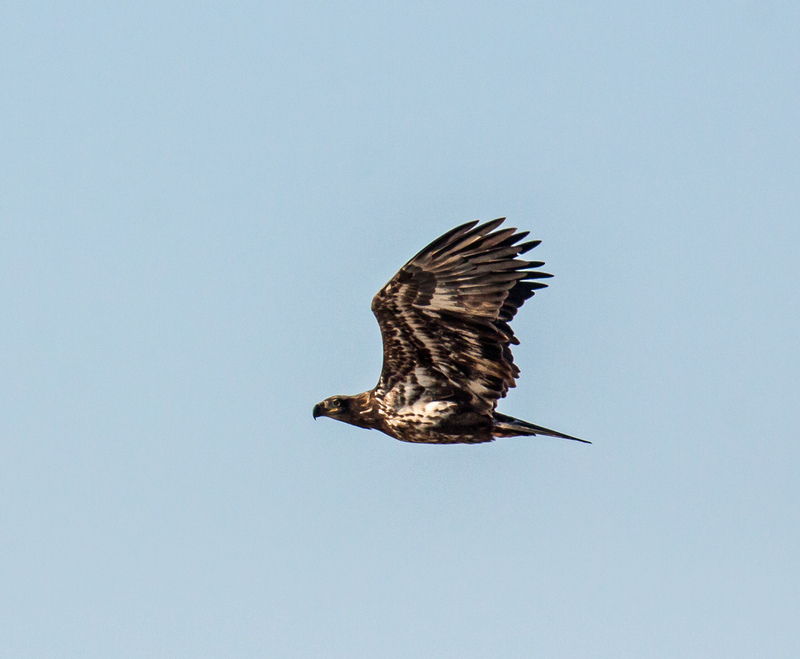 I was happy that I was able to find a shooting angle that allowed me to get a clear view of the eagle’s head and tail. 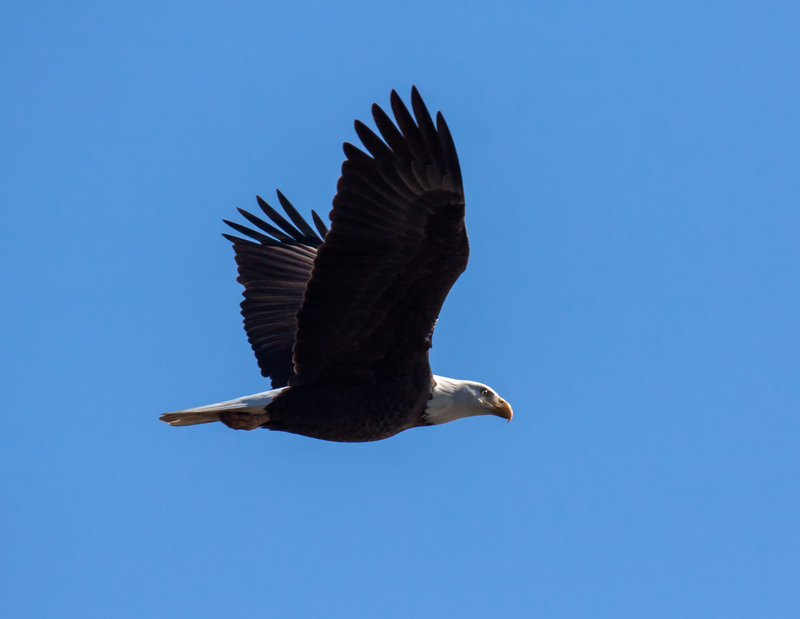 As I was observing a Bald Eagle (Haliaeetus leucocephalus) earlier this week at Occoquan Bay National Wildlife Refuge, something seemed to catch its eye and without warning the eagle took off into the air. I was a little slow in reacting, but managed to capture an in-flight shot. The image you see is framed just as I took it. I was already partially zoomed out at 375mm on my 150-600mm, but that was not wide enough to capture the full wingspan of the eagle. When the action happens so quickly, it is hard to simultaneously track the moving subject and use the zoom—it is a bit like trying to rub your stomach and pat your head at the same time. The second shot shows the eagle just before the takeoff. I like the tension of its body position and and the intense focus of the eagle’s eyes. 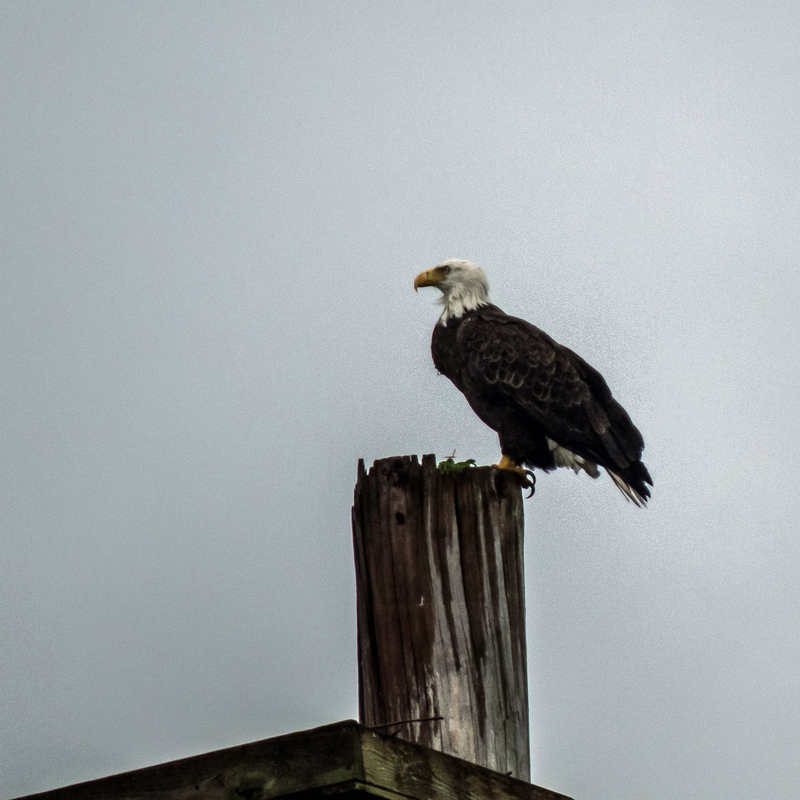 The final shot was taken before the other two and gives you an idea of how the eagle was perched as I approached it. 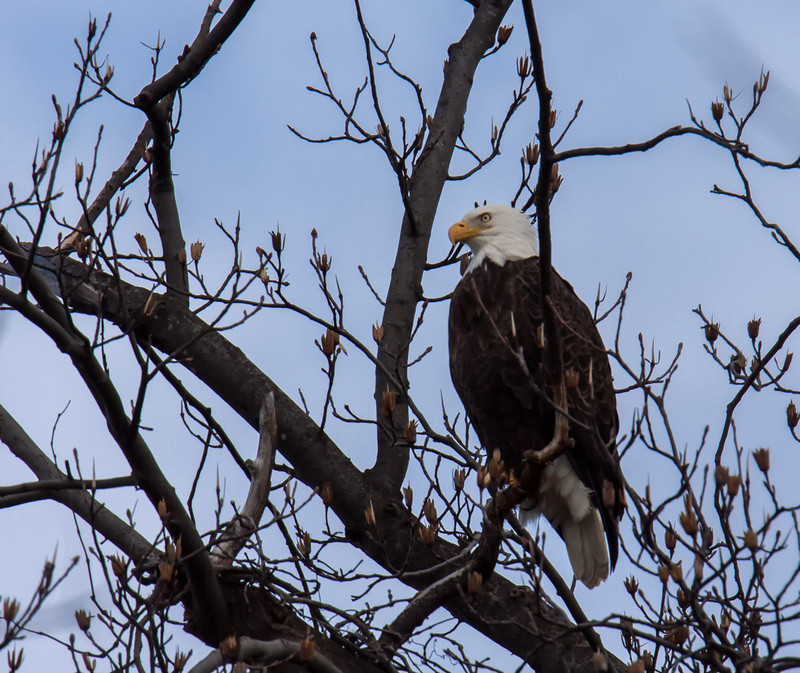 There were a lot of branches surrounding the eagle and I tried to move slowly and cautiously to get a mostly unobstructed shot. For those of you in the United States celebrating today, I wish you a very happy Thanksgiving Day. It is good to pause and reflect on all the blessings in our lives, not just on the one day each year that is set aside for doing so. I thank all of you for your continuous support and encouragement for me as I share my photography and my life in this blog. Over the last six years it has become part of my daily life and I consider many of you to be a part of my extended family. 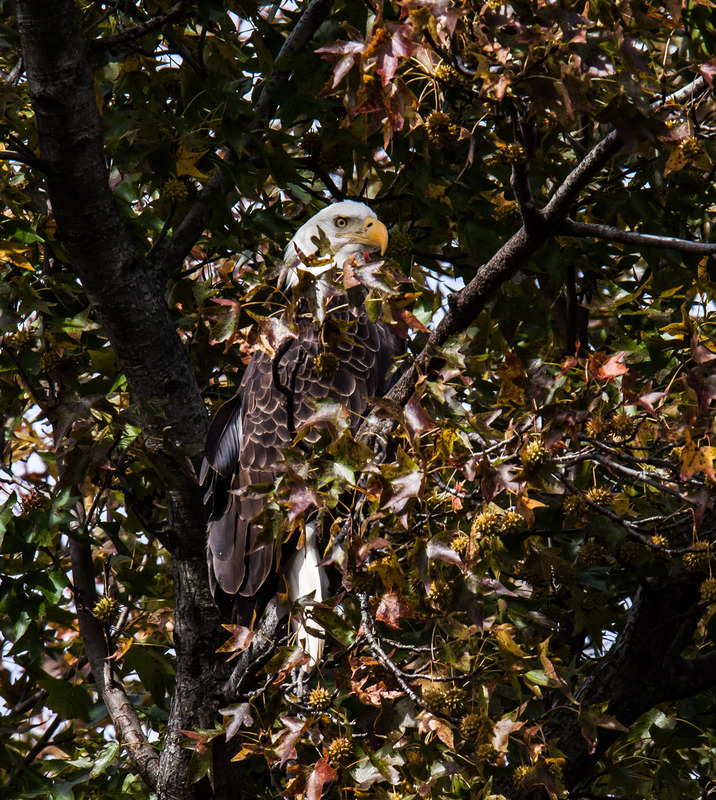 As I rounded a curve on a trail at Occoquan Bay National Wildlife Refuge one morning last week, I spotted a fierce looking Bald Eagle (Haliaeetus leucocephalus) almost directly overhead in a tree. I wasn’t sure if the eagle had seen me, but when it looked down and glared at me, I realized it was quite aware of my presence. In several earlier postings I have mentioned that this is a tough time of the year for spotting birds, because most of the leaves are still on the trees. Often I can hear birds, but I can’t see them. It turns out that the leaves on the trees can also hide me from the birds sometimes. I think that is how I ended up almost directly below this eagle, forced to shot upwards at a somewhat uncomfortable angle. It wasn’t long before the eagle decided that it had had enough of me and it took off. Alas, I was not able to capture any in-flight shots, but I am definitely happy with the shots I managed to get of the perched bald eagle. 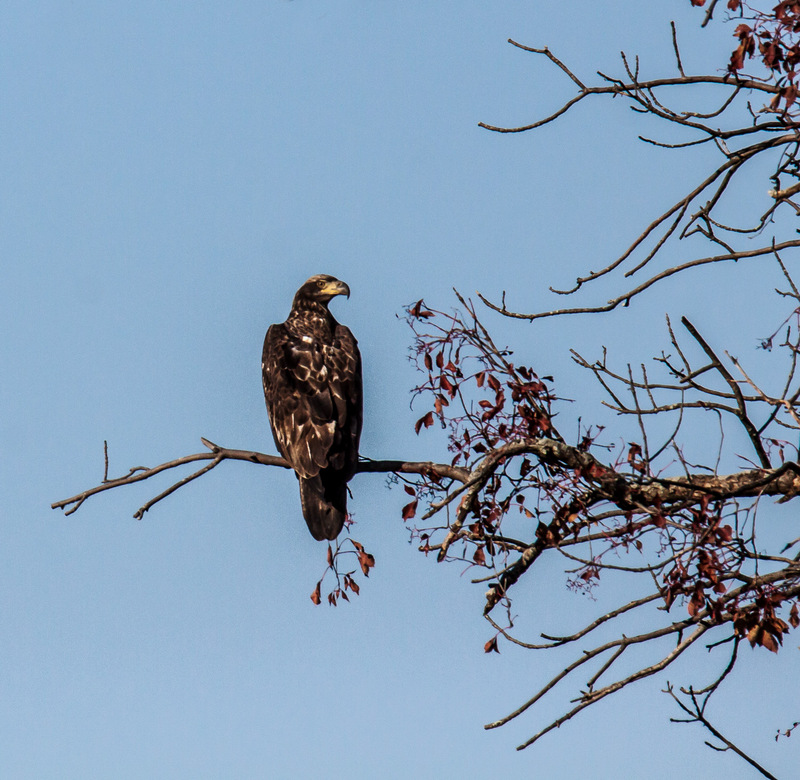 It has been quite a while since I last got a shot of a Bald Eagle (Haliaeetus leucocephalus), so I was really happy when I saw this young one in the distance earlier this week at Occoquan Bay National Wildlife Refuge. 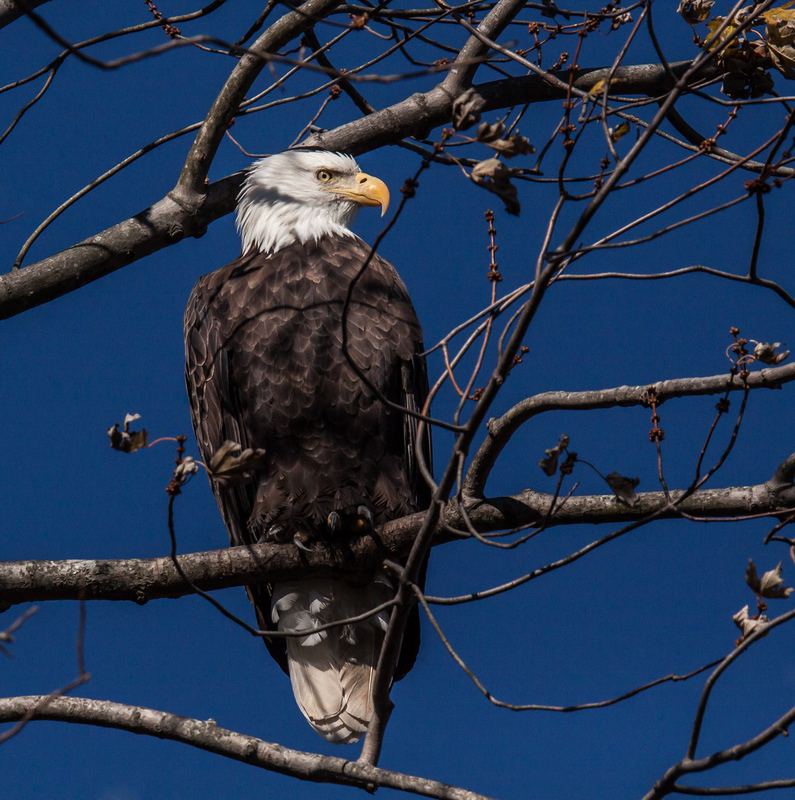 Experienced birders can tell the age of a Bald Eagle by its coloration. All I know for sure that it is less that five years old, the age at which the head feathers turn white, though I have the impression that it is pretty young. As is often the case, the eagle spotted me right afterwards and took to the air, but I managed to get a shot as the eagle flew off. 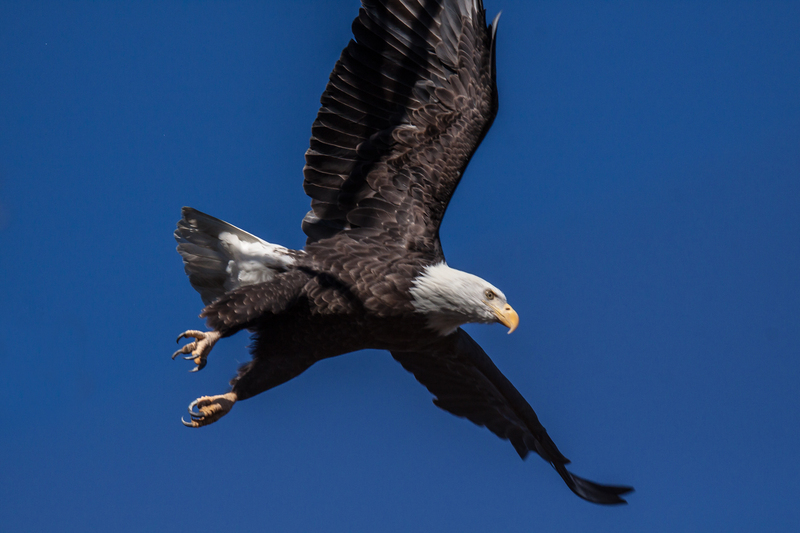 When it comes to eagles, it is always a challenge to get a shot, because the eagle’s eyesight is so much better than mine and its reaction time so much quicker. I therefore have to react almost instantly when I see one and then hope that luck is on my side. Despite the light rain that was falling, I decided to go on a photo walk yesterday morning at Occoquan Bay National Wildlife Refuge. Most of the smaller birds seemed to have taken shelter in the trees, but I was thrilled to catch a glimpse of a couple of raptors that were perched prominently in the open. 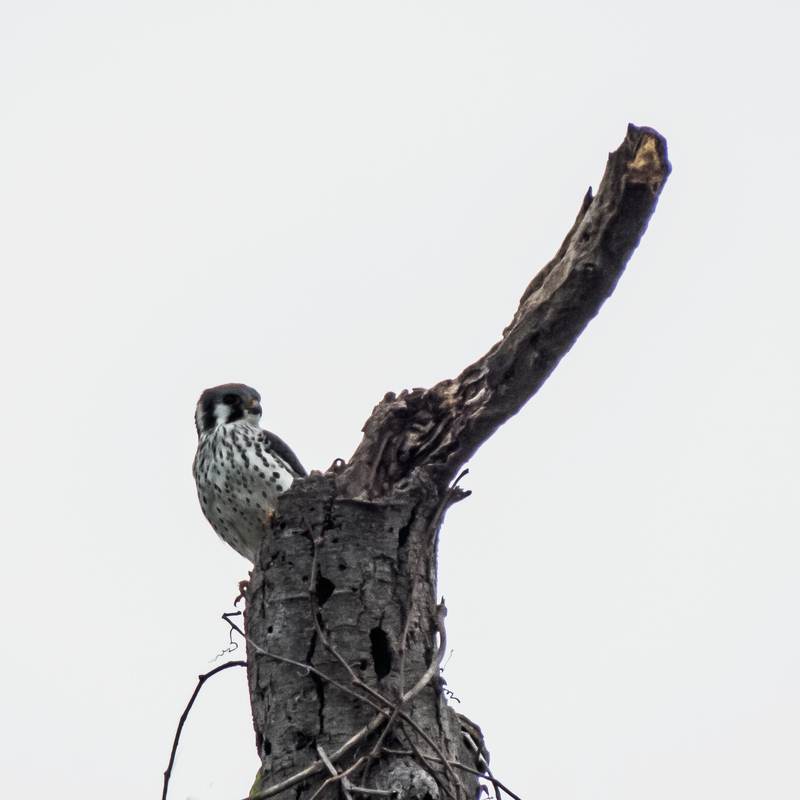 It was an interesting contrast to spot an American Kestrel (Falco sparverius), one of the smallest raptors in our area, and a Bald Eagle (Haliaeetus leucocephalus), one of the largest. The sky was really overcast, so there was not enough light to reveal all of the wonderful detail of these powerful birds. Still, it was nice to be able to capture some images of birds. Before too long the number of insects will start to diminish and my blog will become increasingly populated by birds. I figure that for another month or so, though, insects will continue to be featured most often, which is good news for some viewers and bad news for others.